The anti-Semitic psychos are already out blaming the Christchurch massacre on a Zionist plot. It’s part of what they call “The Zionist Master Plan & the Clash of Civilizations.” Palestinian solidarity has no affinities whatsoever with hatred of Jews & those who were attracted to it on that misunderstanding need to be isolated & excluded from it on principle. They stink up the movement. Accidentally, I discovered that others have put me in Facebook groups I don’t agree with. Like the group “Friends who like Omar Abdullah,” the politician who introduced pellet guns to Kashmir. Don’t make you hunt me you down & block you. And don’t put me in these groups with sycophantic politics. Insulting Putin can now land a Russian in jail under laws he just signed making it illegal to spread ‘fake news’ & for insulting Russian officials. Those who blithered on against “Russiagate” should stay in hiding for a while. Those who support Russian bombing of Syrian civilians should go into hiding permanently. But now we know why fascists Vanessa Beeley & Eva Bartlett have found their new assignment justifying Russian intervention in Ukraine. Every year, 17,000 Indian farmers commit suicide due to debt, crop failure, & impoverishment stemming from neoliberal agricultural policies. Gopal Shetty, a member of parliament for the Hindutva nationalist BJP party, said not all of them take their own lives because of unemployment & starvation but because it’s ‘fashionable’ these days for farmers to kill themselves. Pesticides used in neoliberal farming combined with nationalist hate have eaten his brain. These children are war refugees in the al-Khol camp in northwest Syria near the Iraq border. Media has been reporting that most of the refugees in that camp are the wives & children of of ISIS fighters who fled intensified US-coalition bombing in the ISIS-controlled region of Baghuz. According to some reports, of the 65,000 residents in the squalid camp, only 500 families have ISIS associations. The rest are civilians who also fled US-coalition bombing. This is the camp where reportedly Shamima Begum lives. She is the British teenager who went to Syria in 2015 to marry an ISIS fighter & was recently stripped of British citizenship when she asked to return home with her children. When her infant son was among those children who died in the camp, a British tabloid referred to him as a “jihadi baby.” There is no such thing as a ‘jihadi baby’. Whatever their parents’ politics, these are children who have as much right to human rights as any other child–if not in practice, at least by international law. Using Muslim-hating as a way to vilify them & justify barbaric conditions is about as low as Muslim-hating can go. Our demands must be for the immediate cessation of Syrian, Russian, & US-coalition bombing & for the immediate, unconditional withdrawal of all foreign military forces from Syria. This bereft child is in al-Khol refugee camp in northwest Syria near the Iraq border. The camp was set up in 1991 during the Gulf War to provide shelter for refugees from Iraq. It was reopened after the 2003 US invasion of Iraq to provide shelter mostly for Palestinian refugees fleeing persecution by the US-installed Iraqi government. During the counterrevolution against the Syrian Arab Spring, it has grown to 65,000 refugees including Iraqis & Syrians fleeing ISIS-controlled areas. Much of the media is reporting the new refugees as wives & children of ISIS fighters but the overwhelming majority are civilians without association to ISIS fleeing the bombing. Russian & Iranian media, & of course Assad propagandists are reporting that Kurdish forces control al-Khol camp under the supervision of US advisers & that Kurdish forces are subjecting refugees to extreme violence & deprivation making it more like a concentration camp than a refugee asylum. That’s probably true but it is also not one whit different than refugee camps all over the region as a result of the war against the Arab Spring uprising. 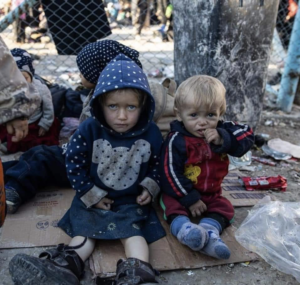 The unspeakable horrors faced by refugees, including ongoing war, starvation, no medical care, freezing temperatures without adequate shelter (many new arrivals have to sleep in the open), are the direct fault of Syrian regime, Russian, Iranian, Kurdish, & US-coalition forces. 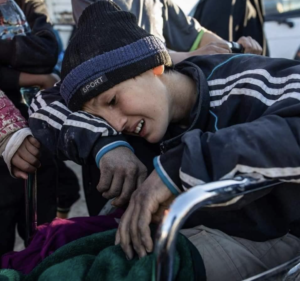 The death rate among children is sky-high (from disease, starvation, dehydration, & hypothermia) & according to one NGO, most children show signs of acute psychological distress, including nervousness, withdrawal, aggression, nightmares & bedwetting. Assad propagandists & their guppies in the corrupted antiwar movement call this state of affairs a liberation from ‘Islamist terrorists’. This is more aptly called war & human rights crimes on an industrial scale. Some even call it genocide & few could argue with that. The only principled demands are for the immediate cessation of bombing by Syrian, Russian, & US-coalition forces & for the immediate, unconditional withdrawal of all foreign military forces from Syria. Every day, 22 US military veterans commit suicide. That is only one of the psychological or antisocial behaviors common among war-traumatized young people. That figure–which many consider an underestimate due to underreporting or because some drink or drug themselves to death–does not include active duty soldiers. A few years ago, it was near impossible to find out how many Indian soldiers committed suicide but the sketchy reports suggested it was increasing as a result of the occupation of Kashmir. (It’s a similar case with the Israeli military.) As this article points out, the suicides that were reported were attributed to family or psychological problems & not to the savageries entailed in occupation. It’s also significant that what the Indian defense department is reporting is suicides among active duty soldiers, omitting veteran suicides which are likely as sky-high as US veteran suicides. 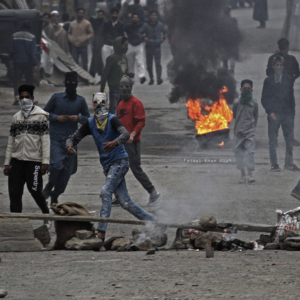 The article refers to the occupation of Kashmir as a “low-intensity conflict operation.” The term ‘low-intensity conflict’ was developed by the US Pentagon to describe its paramilitary operations in Central America in the 1980s. It was a propaganda misnomer then to blunt antiwar opposition & clearly complete rubbish when referring to the occupation of Kashmir which entails nearly a million troops, making it the most militarized region in the world. This very strong piece by Uzdah Jawaid is part of a series titled “Me & Militarization” in Wande Magazine. The series which you can follow at https://www.facebook.com/wandemagazine/ is Kashmiri women writing about their experience of living under military occupation. I’m looking for the services of an affordable exorcist after someone dumped a hateful meme on my wall praising Adolph Hitler for the holocaust. People who spew hatred for Muslims, Arabs, Jews, Blacks, Latinos, women, learning disabled, or anyone are like maggots & they are decidedly not welcome on my wall. Cleaning out the toxic miasma of their hate takes time & money better spent on Palestinian or Bhopal medical aid.